Mantis Cranes has almost 20 years of experience in manufacturing and providing Self Erecting Tower Cranes and City Tower Cranes as well as the crane accessories that you require for your project. Crane Hire Birmingham is one of the main services we provide in the United Kingdom. Mantis Cranes boasts the largest and most diverse hire fleet available in the United Kingdom. We can provide our customers a range of Self Erecting Tower Cranes with jib lengths ranging from 12.7m to 45m and maximum load capacity up to 6,000Kg.Additionally we can provide a range of City Tower Cranes for hire with jib lengths from 20m to 55m and load capacities up to 6,000kg. 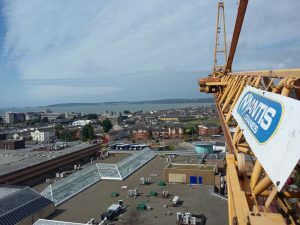 If you have any further queries regarding Crane Hire in Birmingham please contact us at 01388 748 962 or email us at info@mantiscranes.co.uk or use our enquiry form here.